While for many Christmas and this holiday season is their favourite time of year, for many others this time of overload of shopping, media messaging, busy schedules, crowds, and family, can contribute to heightened stress and anxiety. We can enter January not feeling that great physically, and often emotionally and mentally too. “Our present day choices predict our future” Yet often we find ourselves making the same moment to moment choices during the holidays that we’ve made year after year, and then make the same complaints come January. It’s an interesting time of year, isn’t it? As Mother Earth enters her slumber, and the light dims, we sacrifice sleep and rest for shopping and social functions, under artificial lighting. Our ancestors’ bodies would become efficient fat burning machines come December and the cold months ahead, tapping into stored energy from the bounty of the summer and fall to see them through the winter and becoming lean by spring. In contrast, we not only eat more in the colder months, we eat tonnes of refined grains and sugar, and gain fat over the winter. If any of this resonates, I encourage you to reflect on if you have a desire to change that pattern this year. The winter, the holidays, and how you feel during both can be different. A good first step is to examine your holiday rituals. Are there some, or parts of some, that have become obligatory and/or stressful? Do they sabotage what you say you want for yourself? Do they lack joy? Rituals are important, but they ideally change and morph to better reflect who you are and what you want at each stage of your life. The holidays are a time when the preoccupation with food can be overwhelming for anyone, let alone those that struggle with food and body issues. Sadly, because this has become statistically normal in our society we often don’t see the red flags around our own behaviours and thoughts about food because “everyone” else is speaking the same language. Acknowledge ahead of time that, try as we might, we aren’t going to be able to control every situation. If you choose to indulge enjoy it 100%. Eating while feeling guilty or remorseful can actually alter the way your body metabolizes that treat! Additionally, it’s all or nothing thinking that set us up for binges down the road. If you do have an eating disorder, recognize ahead of time that there will be moments when you feel out of control. In fact, you might even prepare yourself by assuming that you'll feel this way at least five, or ten, or twenty times during the holiday season. When you feel out of control, you can count it as one of those expected times. You'll be less surprised, and your need to react through your eating disorder will be less. 2. Make Plans for You This Christmas. 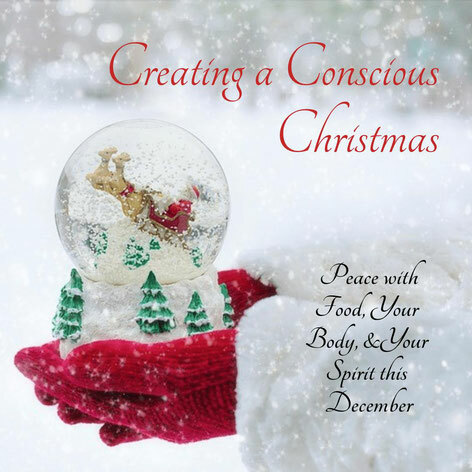 While it is the season of giving, it is necessary to make choices that are self-nurturing too. This could be making time for a favourite yoga or fitness class, or to read a book with a cup of tea, or to mediate. Self-love and radical self-care isn’t about spending money you don’t have, or eating something unhealthy because “you deserve it”. That is actually self sabotage. Creating space for yourself and setting healthy boundaries is not always easy, but these are really what self -care is about, and in turn positively affects all those around you. 3. Own Your Part in Christmas. Do you get caught up in the hype, or do you have a holiday that makes sense for you? Weigh the benefits and draw backs of keeping traditions you find stressful but that you could potentially change or give up. Sometimes you will choose to go along with others wishes, but it is still a choice and making choices are empowering. 4. “What Other People Think of You is None of Your Business”. Others may not be as aware as you and still see food as love. Don't feel pressured or influenced to try food or drink you don't want to. Know that it is about them, not you. It takes courage to step into making tough decisions around family and food, but when you do, you’re gifting everyone an opportunity to shift. And don't play the victim if you choose to have some by complaining afterwards that you didn't want to hurt their feelings. With so many inventive recipes out there, it’s easy to find an upgraded recipe of an old favourite made with higher vibrational ingredients, that works for your tummy, blood sugars, or other health concerns, and is a more loving choice for yourself. Bring it along to holiday functions so you don’t feel deprived (and can introduce others to your awesome creation!). A treat shouldn’t be a toxin. Make something with wonderful and real ingredients instead of something filled with high fructose corn syrup and chemicals. Processed desserts and treats are made with inexpensive ingredients to reap the highest profit with no regard to your health. A piece of homemade (insert favourite treat here) with high quality ingredients is a better option in every way. 6. “Friends Don’t Let Friends Fat Talk”. Fast forward to January 2nd. Your body will balance out from your break from routine or extra indulgences in a week or two when you resume your usual healthy eating, exercise, and sleep schedule. It always wants to, has in the past, and will again. You don’t need to go to extremes. In the meantime, listen and recognize when your inner critic is on the lose. Sometimes in is in your head, but other times we actually verbalize out loud with others. Conversations about how much we ate, how guilty we feel, how fat we feel or look, serve no purpose other than to perpetuate the belief that our worth is no more than our dress size, and to give our power away. Instead shift your thinking to gratitude for all that your body does for you, and all that you have. Support your body, and trust it. Remember, every time you eat is a new beginning and opportunity to choose something healthy. 7. Reach Out for Support if Needed. Determine ahead of time the person (or persons) that can offer support if needed, and a plan that will work for both of you should you need their help.